NEW ORLEANS – There’s a script. Dating back to 2002, the first New England Division III team at Williams’s late-September Purple Valley Classic is either Williams or MIT. That team goes on to make the NCAA Championships (usually by finishing first or second at regionals) and does pretty well there (usually in the top ten). Twenty-six minutes and 43 seconds into 2014 edition of the race, both lead actors were executing their lines flawlessly. The duel for the win was coming down to, as usual, No. 6 Williams and No. 8 MIT with both teams’ top three runners across the line – including two in the top three for Williams – 13 spots deep into the final individual results list. In the space of just the next 10 seconds, however, that long-familiar script was crumpled up and cast aside. Lurking behind Williams and MIT was unheralded No. 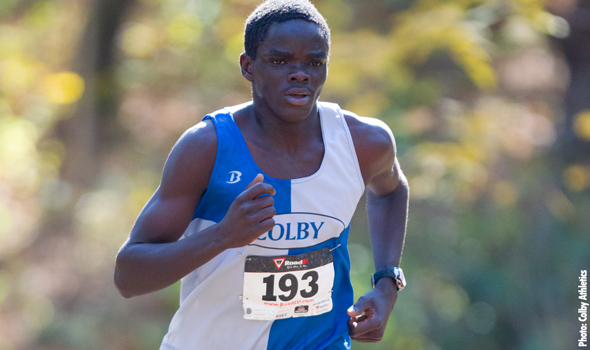 17 Colby with two top-10 finishers in individual winner David Chelimo and sixth-place Jeff Hale. The White Mules put a pack of three guys into the finish chute in 16th, 17th and 18th – seniors Charlie Coffman and Ben Lester, and sophomore Silas Eastman, respectively – to round out their scoring line-up before their rivals could even count their fourth men finished. When the dust settled and the printers spit out their official results, it was head coach Jared Beers’ Colby squad listed atop the team standings, edging out host Williams by eight points, 55-63, and MIT by another nine points. For the defenestrators, the disruptors, the stubborn Mules, this result has been a long time coming. Just, whatever you do, don’t call them "dark horses." Starting a piece about a college team with zoologic-historical background on a school’s mascot and how it crypto-ironically represents said team’s fortunes is trite, hackneyed, stupid, and boring. It is the crutch of the laziest of the lazy sportswriters. Also, sometimes, it’s too good to pass up. Please forgive me. If Bowdoin has the polar bear and the University of Maine has the black bear, why does our very own Colby have the white mule? Colby’s infamous mascot didn’t come about until 1923, when one outgoing and innovative young man by the name of Joseph Coburn Smith, published an editorial in the school newspaper. In that editorial, Smith, editor of the Echo and nephew of Louise Coburn, suggested that the Colby football team be symbolized by a “white mule.” They were to no longer appear as the “dark horse” of college athletics, since they so often upset predictions made by local sports writers. After reading Smith’s article, a group of students located a white mule on a Kennebec farm and borrowed the animal for the Bates game on Armistice Day in 1923. Dressed in blue and grey, the mule was placed at the head of the band and student body as they marched onto the field. Colby defeated Bates 9 to 6 that day with the help of its newfound mascot. The win was enough to make Joe Smith’s suggestion permanent. Today we are still the white mules and now you know why. For the Colby men’s cross country team, the nickname is fitting, though not at all in the way Joe Coburn Smith intended: the rest of the NESCAC has beaten them like a proverbial rented mule. Their early history is an old school New York Mets-ian – to draw a baseball analogy – mix of success and terrible luck; up until 1993, even when they won, they lost. And their late history is a new school Mets-ian undiluted futility: the period from 1994 to 2012 was just spent losing. Prior to 1993, the NESCAC didn’t permit any its teams (across all sports) to compete at national championships—so of course Colby won the conference three times in that period. Also, there have been two ties for first place in ‘CAC history—so of course they both came in years that Colby won. The real capper, though, is the 1993 season. That was the first year that the Little Ivies were permitted to compete at NCAAs, and the last year that Colby won the conference. How did the NESCAC, with the Mules as its best team, do in its first-ever nationals? Williams tied for fourth place. Colby didn’t make it out of regionals. The two decades following 1993 were much, much simpler. From then through 2012, Colby averaged a ninth-place finish in an eleven-team conference, only doing better than seventh twice in 19 years. They took last five times and second-to-last five other times. From 2004 to 2012, they were in the bottom three every single year. That’s abruptly changed in the last twelve months. At last fall’s conference championships 1, Colby finished fifth, its best finish in a decade and only the third time in 20 years that it finished in the top half of the conference. The Mules were actually tantalizingly close to finishing third, just three points behind Bowdoin and eleven back of Tufts. Then, at regionals, they were sixth, beating Bowdoin but losing to Bates, the third leg of their Maine rivalry. After thirty years of bad timing, they were finally the beneficiary of well-timed rules changes. Division III had long capped the number of teams to qualify for nationals from each region at five, and the 2013 season was the first one for which that cap was removed. Colby was the first-ever men’s team to benefit from the lack of a cap (along with Chicago out of the Midwest) and acquitted themselves well in its first-ever nationals, finishing as the fourth New England team in 22nd overall. This year, the WMs are just one of three teams 2 to return their entire top six from NCAAs, and the season is off to a scorching hot start. The Purple Valley win two weeks ago marked the first time Colby beat Williams since that star-crossed 1993 ‘CAC meet. After never qualifying for nationals in school history, then only being nationally ranked in the 20s for the last four weeks of 2013, the Mules are now the No. 6 team in the country. How did they bleach and breed themselves back from dark horses to white mules? How did they—in the parlance of Your Favorite Canadian—get from “the bottom” to “here”? Like any lackluster gathering, they were greatly improved by the arrival of Beers 3. In 2006, just five years after graduating from Colby and against all odds, Jared Beers wound up as the head men’s cross country coach at Colby. “I was all sprints all the way, and when I started as the interim coach, I was still deciding if I was going to go into the strength and conditioning world," he said. "It was kind of serendipitous; literally two weeks before kids showed up, they didn’t have anybody, so they asked me to be the interim coach, and that was my first cross country experience. Beers’s impact wasn’t instantly visible—in his first six seasons, the squad had two second-to-last place conference finishes sandwiched around four last places. He admits that there was a learning curve. But he’s equally adamant that the last two years have been a long time coming. “I’ve been saying for probably five or six years that, a competitive team for us was literally one recruiting class away…We knew the middle of the pack was there, but we needed that guy." In 2013, Beers pulled off the biggest recruiting coup of his career so far, getting two of those guys to matriculate in Waterville. Now-sophomores David Chelimo and Silas Eastman perhaps aren’t the archetypical co-alpha dogs, but here’s what matters: no other team in DIII had a better freshman 1-2 punch. Eastman (96th) and Chelimo (110th) were two of the first four freshmen 5 to cross the line at nationals last fall. There are plenty of urban (well, this is the NESCAC—suburban) legends surrounding Chelimo’s path from Nyahururu, Kenya to Maine. One is that he showed up on Colby’s campus with no intention of joining the cross country and track teams. While that isn’t true, it is a fact that he went for the first run of his life on July 1, 2012. Just two years later, he’s run 3:49 for 1500 meters and is the best runner on the No. 6 team in the country. Meanwhile, Eastman doesn’t run track at all. There’s a decent tradition of long-distance runners skipping a season here or there for skiing—think Ben True, or on the DIII level, Jake Brown of St. Olaf—but Eastman is particularly unusual in that he strictly sticks to cross country running and Nordic skiing. Beers assuredly isn’t complaining, as the 29:38 10k skier is on track to replicate his 25:13 8k run from regionals a year ago. (Eastman ran the same time at Purple Valley this year as last). It took Beers and the Colby men the better part of a decade to get near the top—now how do they not only stay there, but improve? “I hope that we’re so new to this that we keep that underdog mentality," Beers said. "For ten years, that’s been our shtick. I’ve thought a lot about this as we’ve gotten closer to being a competitive team. What’s the next major motivator gonna be? As a coach, it’s a completely different kind of stress. Beers, Chelimo, Eastman, and the rest of the Mules have the added challenge (or advantage, from a motivational perspective) that the entrenched powers in New England aren’t exactly down this year. The weekend after the stunning Purple Valley win, the Colby varsity sat out while Williams drove four hours south to the Paul Short Run, perhaps the best cross country meet on the East Coast. The Ephs’s five-man average of 25:05 at Paul Short was the best by a DIII team in five years, and good enough for the pollsters to make Colby’s stay on top in the regional rankings a short one. No matter; Beers and his charges relish the quality of the region. Most of those extremely good teams (though not Williams) will be at the Open New England meet at Franklin Park on Saturday. And all of the good DIII teams in the area (except for MIT) will be at the NESCAC meet in three weeks. So, if the Mules really are a top-ten team, they’ll have gone through a gauntlet to get there. Their coach certainly believes in them.